New to River Cruises ? Our heated pools with a retractable roof and bar which inventively transforms into a cinema in the evening – an on board oasis for you to relax. Geared towards the more active and outgoing guests, unique activities and excursions are included delivering greater value and extending your cruise experience. Welcome to Prague, the capital of the Czech Republic. On arrival at the airport, you will be met and transferred^ to your centrally located hotel. This evening meet your Tour Director and fellow travellers for a welcome drink. This morning we explore the sights of the Old Town Square on a guided walking tour. We see Mozart´s Theatre, Little Square, the Astronomical Clock and Charles Bridge. Later drive to the 1,000 year old Prague Castle area. must see, as is Josefov, the Jewish quarter. On leaving Prague drive along the Elbe Valley to Dresden, known as Florence on the Elbe. Here we will see the Frauenkirche, the Castle of the Electors of Saxony and the Green Vault with its collection of Meissen porcelain. – where the Potsdam Treaty was signed. The re-unification of Germany after the fall of the Berlin Wall in 1989, saw the city transform into the impressive and exciting metropolis that it is today. See the new Reichstag, the Brandenburg Gate, State Opera House and Alexander Platz – and drive ‘Unter den Linden’. We see the former Checkpoint Charlie as well as other sites associated with the era of the Iron Curtain. This morning you will be taken to the main train station for a journey across the heart of Poland and into the capital, Warsaw. Enjoy time en route to relax and watch the scenery pass by, arriving into Warsaw in the early afternoon. A traditional Polish dinner is included this evening. Our guided sightseeing tour reveals the historic centre where much of the Old Town was rebuilt after the war. Memories of Polanski’s film ‘The Pianist’ come to mind as we visit the Jewish Ghetto with a local guide. See a monument to the Ghetto heroes, the Palace of Culture and the Chopin Memorial. Take an excursion to the Royal Castle. This morning, visit the Concentration Camp at Auschwitz for a guided tour and experience the chilling reminders of the atrocities of World War II. Later, arrive in the picture-postcard medieval city of Kraków, the former royal capital. Sightseeing of this imposing medieval city includes the cathedral and castle on Wawel Hill and on a walking tour of the old town we visit St. Mary’s Church and the Cloth Hall. The rest of the day is at leisure. EmeraldPLUS: Enjoy dinner in a family run restaurant. Today we journey past the Castle of Oravsky Hrad and over the Tatra Mountains, through Slovakia and into Budapest, the capital of Hungary. A warm welcome awaits you from your Captain and crew as you board your luxury Emerald Waterways luxury river cruise ship. EmeraldPLUS: This evening enjoy a night-time cruise, passing under the city’s numerous bridges, whilst enjoying folk dancing and music followed by a traditional Hungarian welcome dinner. Budapest is Eastern Europe’s liveliest and most cosmopolitan city. Enjoy a guided tour of the city sights including the Hungarian Parliament Building, the Buda Castle and the Chain Bridge linking Buda and Pest or an exciting hike on the Buda Hill. This afternoon you depart for Bratislava. This morning we arrive at the city of Bratislava, capital of the Republic of Slovakia. Enjoy a sightseeing tour including the enchanting Old City with its Town Hall, Mirbach Palace and the Gothic Cathedral of St Martin. Alternatively, join an active hike to Bratislava Castle. Today, you have a choice of either exploring Austria’s capital beginning with a drive along the Ringstrasse, where we will see the sights of Vienna’s world–famous attractions such as the Opera House, Burgtheater, Town Hall, St. Stephen’s Cathedral and the Hofburg Imperial Palace. Alternatively, join the guided bike tour instead of the drive around and guided walk. Then, you have free time to sample the wonderful tastes of Vienna. In the morning we arrive in Dürnstein, one of the most enchanting villages of the Wachau wine region. This is the site of the castle where Richard the Lionheart was imprisoned after returning from the crusades in the 12th century. 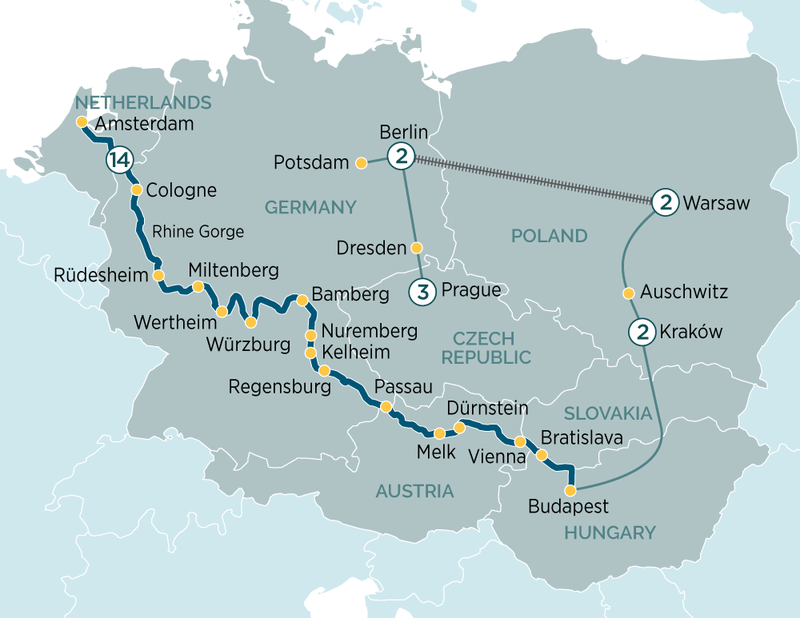 Thereafter, you will drive through the picturesque landscape of this district to the 900–year old Benedictine Abbey of Melk, which features Austria’s finest Italian baroque architecture. Cruise along the Danube this morning, in the afternoon we reach Passau. Cobblestone streets and graceful arcades welcome you in this beautiful city. On this afternoon’s walking tour, stroll through the old town’s narrow alleys and see the hilltop Oberhaus Fortress from the town below. Visit St. Stephen’s Cathedral, a wonderful example of Baroque architecture and home to Europe’s largest church organ with more than 17,000 pipes. After breakfast we arrive in magnificent Regensburg. On our guided walking tour you will have the chance to see one of the oldest bridges crossing the Danube and see the city’s architectural highlights including the Old Town Hall. Today, you will have a sightseeing coach tour of the historic city of Nuremberg. Your coach tour would pass by some of the historical parts of Nuremberg, such as the 900-year-old ramparts, the Nazi party rally grounds, where rallies were held from 1933 until 1938 among other sights. This morning we arrive at Bamberg, a UNESCO World Heritage city. Boasting one of Europe’s largest intact medieval town centres, Bamberg is bursting with original character and charm. At the centre of the town is the largest preserved old quarter in Europe. Known as the “Pearl of the Romantic Road”, Würzburg is surrounded by sloping hills covered with vineyards. Join our guide for a walking tour of Wurzburg followed by a visit to the Bishops’ Residenz, one of Germany’s largest and most ornate baroque palaces and a UNESCO World Heritage Site. Your tour highlights the palace’s unique staircase, elaborate 18th century frescoes and the amazing 3–dimensional stuccowork. Today we start from the stunning medieval glass-blowing town of Wertheim, where you have the opportunity to explore on your own. Then, travel by coach to the picturesque village of Miltenberg on the Main River. The village creates an imitable feeling of Bavarian life in the middle ages and the Old Town is lined with well–preserved half–timbered buildings. The gothic Merchant Hall is an impressive symbol of past affluence created by trade from river traffic. After breakfast arrive in Rüdesheim, one of Germany’s most popular towns. You will either have a choice of visiting the Siegfried’s Mechanical Musical Instrument Museum or if you feel active take a guided hike through vineyards. Continue exploring and perhaps taste the famous “Rüdesheimer Coffee”, made with Germany’s most famous brandy Asbach Uralt. After lunch, the ships will sail through the spectacular Rhine Gorge. We will pass the infamous Lorelei Rock where sailors are said to have been lured onto treacherous rocks by enchanted temptresses. In the early evening we arrive into the beautiful 2,000-year-old town of Koblenz. The ship sails from Koblenz in the early morning, cruising along the Rhine we arrive in Cologne. Founded by the Romans, Cologne is one of Germany’s oldest cities and is famous for its magnificent World–heritage listed Gothic Cathedral and market squares lined with cafes, shops and beer halls. This evening the captain will be delighted to welcome you to the Captain’s Farewell Gala Dinner. The ship sails along the Amsterdam Rijnkanaal and into Amsterdam. This morning you can decide to either enjoy a glass top canal boat tour through Amsterdam’s canal or a guided bike tour. After the canal cruise, you will have free time to visit some of Amsterdam’s other famous attractions, such as the Rijks or Van Gogh Museums, or simply enjoy the lively atmosphere and watch the world go by. After breakfast, your tour concludes and you will be transferred to the airport for your ongoing flight. Subscribe to be first to receive the latest Emerald Waterways news and offers. You'll also receive $100* off your next Emerald Waterways cruise.